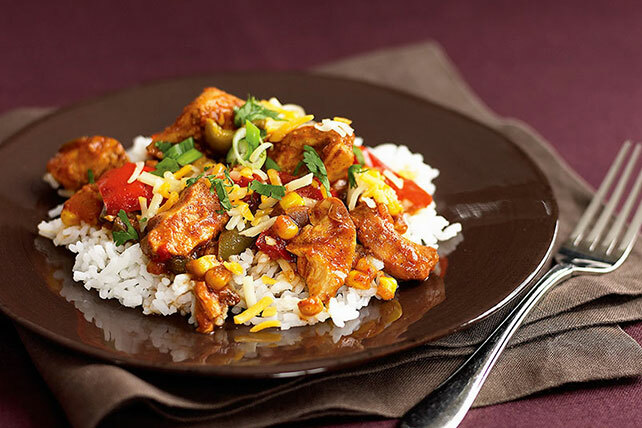 Tex-Mex chicken with authentic flavor is as easy as combining seven ingredients in a slow cooker—and adding a sprinkle of cheese before serving. Toss chicken with seasoning mix and flour in slow cooker sprayed with cooking spray. Add peppers, corn and salsa; mix lightly. Cover with lid. Cook on LOW 6 to 8 hours (or on HIGH 3 to 4 hours). Stir chicken mixture. Serve over rice topped with cheese and onions. Top with chopped fresh cilantro before serving. Cool any leftovers, then refrigerate up to 3 days. Reheat in microwave or on stove top before spooning onto warmed flour tortillas and rolling up. Substitute 1 undrained 14.5-oz. can diced tomatoes with green chiles for the salsa.